To create a range of effects across seven hours, to support the epic tale of the return of magic to Georgian England. Working closely with director Toby Haynes, Milk designed and made standalone VFX sequences in each episode, portraying the magicians’ use of the elements to create magic; environment work to bring the magical fairy world to life; crowd work to help portray the Battle of Waterloo; as well as creating a large body of invisible, seamless effects to support the narrative. Milk also undertook the traditional work associated with a period drama such as paint outs/clean up, set extensions and matte paintings to set the scene and add scope and scale in Georgian England. 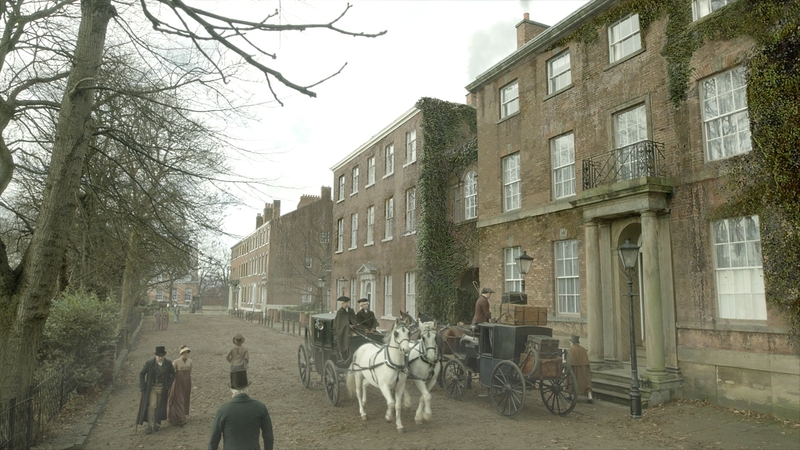 The key VFX sequences in the first two episodes include bringing the York Minster statues to life; the scene-setting opening sequence showing the Shambles and York Minster, which introduces the world of Jonathan Strange and Mr Norrell in episode 1; and the sand horses and the fleet of rainships in episode 2. Milk’s work in subsequent episodes includes crowd and effects work on the Battle of Waterloo. The Milk team spent several months doing R&D prior to the shoot and during the first few months of the shoot on the key sequences in the series, which proved invaluable. Milk collaborated closely with Toby Haynes and producer Nick Hirschkorn prior to pre-production and throughout the process with the production designer and edit team. 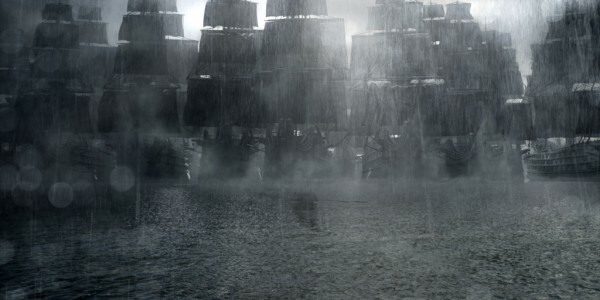 Milk created the fleet of rain ships conjured by Mr Norrell in the Port of Brest to hoodwink the French Navy, at the opening of episode two. This fabulous concept in the book and script was a challenge to realise. The ships needed to be made of rain but effective enough to fool the French Navy sufficiently for them to get in a boat to investigate closely. We received basic sketches from the production, which we turned into concepts. The look we designed was best achieved by backlighting the ships so that they were silhouetted in the sequence. Director Toby Haynes’ brief was to create the look and texture of a painting of the period, channelling a Turner-esque style and mood particularly for the sky. The sequence was shot in a pond on location in Yorkshire against five 20m x 20m green screens. Milk replaced everything in shot except the actors in the boats, which travel out from the shore to investigate the fleet. The rain ships had to therefore stand up to close scrutiny. Firstly the Milk team replaced the pond water with sea and made it feel vast. We put raindrops on to the sea in order to create the feeling of being in the middle of a vast storm, which was done with a mixture of 2D and 3D. Our 3D team supplied ocean, rain and different variations of smoke elements. The sea extension, waves and rain rippling were created in Houdini and subsequently rendered in Maya using Arnold. 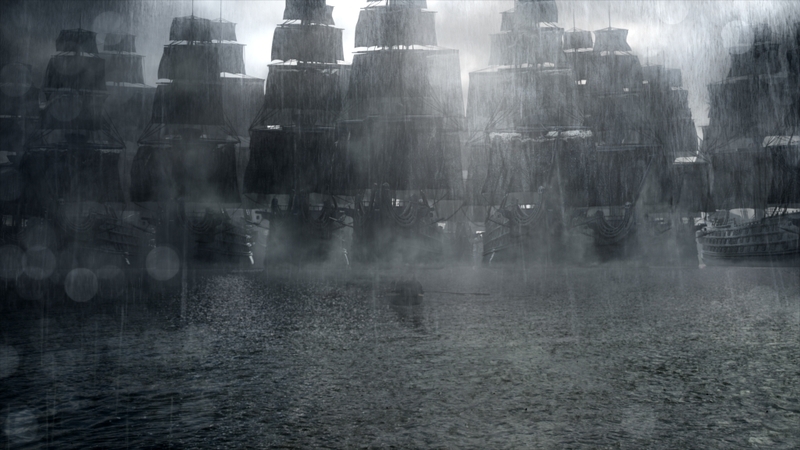 The rain, mist and rainships’ fog elements were created and rendered using Houdini. A deep compositing workflow was used to ensure the correct and efficient layering of complex elements together. Concept artwork was supplied by the production. Milk then built full CG ships, with a galleons sails. They needed to feel like real ships from a distance but up close had to look like water – as if created from both the ocean and rain. An organic fluid look was achieved with swirling effects in 3D and swirling displacement effects and interactive rain created in Houdini. Water effects, rain effects, added smoke, mist and lightening were added by Milk’s effects team to help create the atmosphere. The Milk team had to track the actor’s hand as he reaches out to touch the rain ship and the effects team added an interactive rain splash as he does so. Milk created the heavy clouds and sky in 2D. The team were given various shot elements which they composited together to evoke a dark gloomy effect with a painterly look. The composition of the shot assisted this: with the horizon line occupying one third of the screen and the sky and rain, two thirds. The team’s challenge was how to shoot this sequence while staying as faithful as possible to Susanna Clarke’s novel. Milk’s VFX Supervisor JC Deguara worked closely with Toby Haynes to design and choreograph a sequence that would feel epic, be achievable and fulfil the storytelling appropriately. In the novel the horses gallop around the beach and then later out to sea where the sailors on the ship lasso them. For the television series however, Jonathan Strange conjures horses to burst from the sand on the beach and charge towards and slam into the side of a ship stuck on a sand bank out at sea, in order to release it. 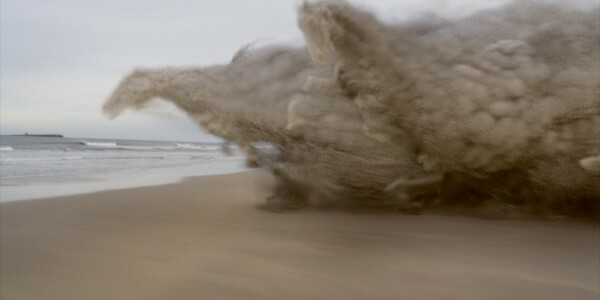 The conjuring of the horses starts with a tremor style effect, breaking up the sand on the ground until they erupt out and take the form of horses. The sequence was achieved in just eight shots yet still feels epic for television. JC Deguara, Nick Hirschkorn and Toby Haynes did a second unit shoot with a drone – to give an expansive aerial feel for the travelling shots. Milk created a previz to demonstrate the need for a drone to shoot the aerial travelling shots. A travelling shot with galloping 20 foot sand horses requires a camera to travel with them to maximise the effect of their velocity and power. We used a drone to shoot various test passes, making use of a line of rocks sticking up out at sea and the wake they created. We used this material to create the sequence including the wake effect. The Milk team undertook an R&D period in which we worked out how the horses would run and how the sand would break apart. Some of the horses were designed to create a sandstorm like trail behind them as they ran. Once this hit the ship it helped create the effect of a blanket of airborne sand exploding. Effects-wise, Houdini was used to both simulate and render this sequence. We created tremor-style sand cracks that radiate out from the point where Jonathan Strange’s hands impact the sand, branching and spreading out into multiple paths across the beach until the giant horses erupt from beneath. We wanted to ensure that there was enough space between them to convey their scale and allow them the space to charge towards the ship. The horses themselves were rendered as volumes with additional particles and rigid body chunks falling from the body as the creatures gallop down the beach and smash into the ship. The underlying geometry was deformed and broken up to produce areas that crumble or remain only partially formed as if it were made of wet sand. Additional interaction was added where the feet hit the sand or water, helping to ground the effects in the live action and increase the impression of weight and power. In terms of animation, we built a full model of a horse, based on a hybrid of a shire horse for its power with elements of a race horse added in, giving strength and speed. These were fully animated and charged over and under the ship as they hit it. 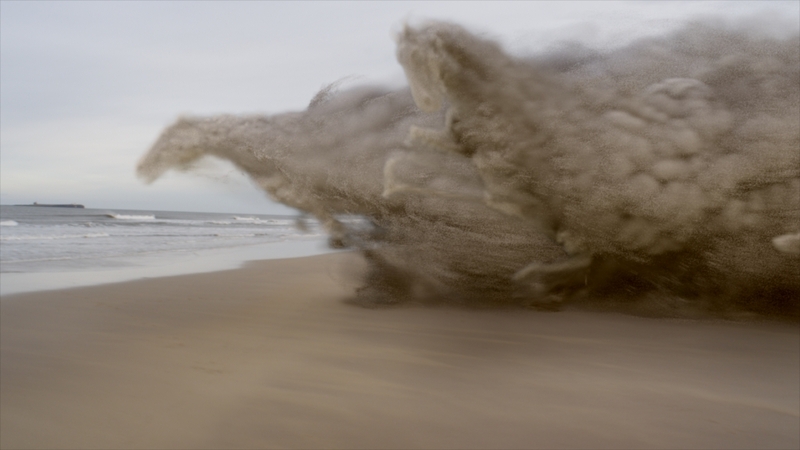 The horse was designed to emit sand as it ran, and create an aesthetically pleasing sand trail. Milk created a full CG built, fully textured packet ship, based on references provided by the production designer and director. The ship was fully animated to interact with the crashing sand horses. Even down to cloth simulations for the sails.We also created digital environments that we composited into the background of any shots that didn’t include the actual beach because they had been shot facing out to sea. Milk worked closely with Toby Haynes to achieve the design and style of the dark fairy world Lost Hope. His early idea was to create a dark, macabre world devoid of life, based on millennia of war debris stacked in layers on a battlefield. Everything about the shot needed to evoke a sense of death and chaos: A bleak world based in a battlefield that has been used hundreds of times over millennia. Milk’s Grant Bonser created the concept designs. Milk created the Road to Lost Hope environment in full 3D. The establishing shot was created with a long camera-tracking move – when The Gentleman takes Stephen Black through the woods towards Lost Hope itself. When the parallax lines up the image of a skull within Lost Hope gradually comes into view. This entire sequence was designed by Milk from concept to final shot. Key elements were built and instanced for the environment including armour, skulls, layers and layers of 3D models, all piled on top of each other. We added atmosphere using rolling mist, and smoke in the foreground and volumetric lighting. The only real element in this shot was the actors and some trees. The shot is used multiple times throughout the series; planned so that we would simply have to track and re-render each subsequent version. Multiple stand-ins were used for key assets such as towers, trees, one stand in for skeletons and debris, rotating and creating new versions of it. Sim cloth was created for flags. All 3D trees were modelled in mudbox for example. We created tree extensions and two high-resolution trees that resembled gnarly creatures. The first time we see the Lost Hope building itself it is shot from a long camera track move, we see a spot where a skull in the building is revealed. Milk built CG cobwebs, props and candles. For the candlelight we used a live-action flame and instanced it, and then used that to light the scene – so that bouncing and flickering light appeared realistic. The entire environment was CG except for the characters themselves. Volumetric lighting was used to create the eerie, magical atmosphere.